We hope you are ready for another great week- ready to REVIVE your body, mind, and spirit!! We would love to encourage you in the studio this week for sessions and for our Lunch and Learn this Friday at 12:30! Today, we want to inspire you with one of our Holiday Extravaganza top 5 winners- Mary McKillip! Mary is a stunning women inside and outside and we are so proud of her health journey. Read below to hear about Mary's transformation story! I never thought Trans Fit would be the right place for me. I have known Caroline for years but was always reluctant to reach out to her for help. But after years of trying my own exercise plans and failing with various quick fix diets resulting in the inevitable creep of weight gain, I called Caroline and, well long story short, she changed my life. Oh it has not been easy. All of us have our own struggles to overcome in the journey to better health and I am no exception. For starters, I had to deal with a vicious case of panic attacks that would occur in structured social settings and I quickly learned that the Transfit workout sessions were a huge trigger. During a particularly crowded Transformer class, I had an awful panic attack that left me feeling dizzy and seriously afraid I was going to collapse on the floor. I walked out of the class and swore I would never return. After making many excuses about not coming back, I opened up to Caroline about the panic attacks and said I just could not be there anymore. I assumed she would express sympathy and tell me that she understood my decision. But I will never forget what she said- â€œI am not giving up on you. Come back to TransFit and we will get you through it.â€� Over the next several months, she took it slow and kept a close eye on me. She made sure I booked the small group classes with only a few people. She adjusted my workouts so I was not feeling pressured. She reminded the class to â€œbreathe and smileâ€� but I knew that was mainly directed at me. A gentle reminder to stay calm and know she was on my side. Gradually, my anxiety subsided and Caroline started pushing me out of my comfort zone. We started boxing together which I am surprised to say that I really enjoy! And after much coaxing, she even got me to jump rope! Now I feel comfortable at TransFit because I know I am supported. It is a place where I can be myselfâ€” with all my flaws and insecurities-- I know I am among friends who want to help me become better physically, mentally and spiritually. Getting through the anxiety now means that I can focus on the whole reason to be hereâ€”get healthier! Next up Caroline had to help me get through a mean sugar addiction that manifested itself in a total addiction to Peter Pan peanut butter! With Carolineâ€™s help, I gradually went from peanut butter graham crackers to peanut butter in yogurt to peanut butter on bananas then apples and finally no peanut butter. It has been 3 months since I have had any! With the combination of workouts 2-3 times a week and a focus on better nutrition, Transfit has allowed me to reach many of my goals. I still have work to do, but I am more confident that I can do it. If I can get through all these hurdles, then I know anyone can make it through their own struggles and reach their goals! Mary, we are so proud of you! You have encouraged and inspired us all! Keep motivated- keep striving to reach your goals each hour, giving your best! 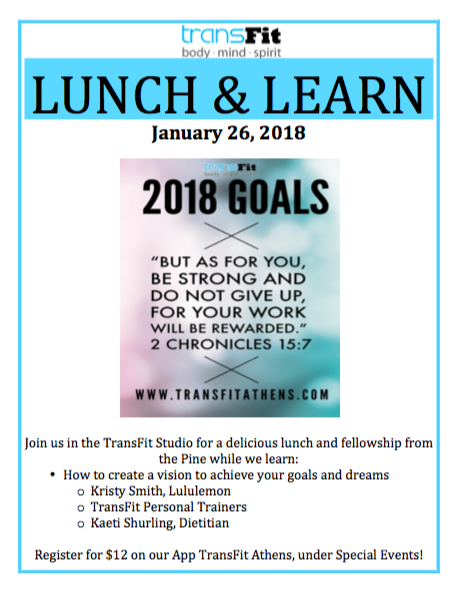 We would love for you to join us THIS FRIDAY for our Lunch and Learn! We will be focusing on goals and dreams. Please sign up for the Lunch and Learn by Thursday at 1 PM. You can sign up on our FREE app under the SPECIAL EVENTS tab! We hope to see you this Friday! If you have any questions, please email us at transfitathens@gmail.com. New Recipes and Lunch & Learn You Don't Want to Miss! Check out this New Recipe! You Will Love It!